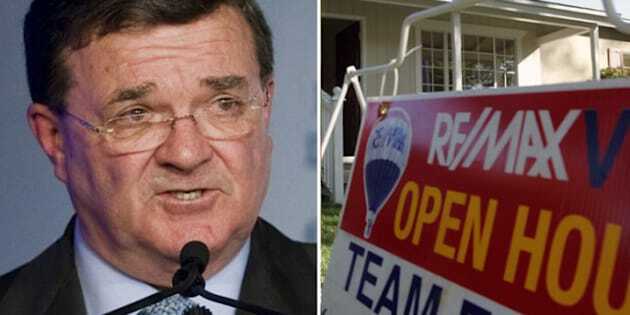 OTTAWA - Pressure is building on Finance Minister Jim Flaherty to intervene for a fourth time on mortgages to keep Canada's housing market and household debt in check. When he met with economists in early March, Flaherty heard conflicting advice about whether it was time to clamp down Canadians' appetite for housing and new debt. Since then, the Bank of Canada has reasserted in its interest rate statement that household debt is the "biggest domestic risk" and, late last week, TD Bank's chief economist Craig Alexander called on the minister to wait no longer. Alexander has suggested three options and asks the minister to choose one, including reducing the maximum amortization on mortgages to 25 years from 30 or hiking the minimum down payment to seven per cent from five. As a third option, he suggests a means test for those seeking loans by ensuring they can afford to make payments as if mortgage interest charges rise to 5.5 per cent, about twice as high as many current rates. "I'm not recommending we do anything that would drastically hurt the market," said Alexander. "It's like you are driving on ice, you don't slam on the breaks, you just tap the brakes to diminish the risk of a problem." Capital Economics analyst David Madani believes it may already be too late to tighten mortgages and that house prices are due to start falling. In the past six years, Flaherty has tapped the brakes on three separate occasions, starting when amortization was at 40 years and no down payment was required to obtain a mortgage. Each time, Canadians took notice for a while, then proceeded to again jump back into the market. The latest figures released last week show household debt accumulation is still rising at six per cent annually, home sales climbing by 8.6 per cent and the average home price near record levels at $372,763. Alexander believes Flaherty, who expressed concern about household debt after his March 5 meeting with economists, is resisting intervening now because he has a bigger concern. With employment growth having stalled in the past half-year, Flaherty fears discouraging home buying would at the same time kill construction jobs. In one sense, Flaherty is in the same box as Bank of Canada governor Mark Carney, who dares not raise interest rates because it could disrupt other parts of the economy. The argument against not acting, however, is that if housing does not cool on its own, when the correction does come it could be drastic enough to stall the fragile recovery. On the other hand, notes Derek Holt of Scotiabank, if Flaherty applies the brakes, he might get more slowing than desired. That could not only hurt construction, but the overall confidence of consumers, whose spending represent about 60 per cent of the economy. "One has to be careful about what one asks for," he explained. "We've already tightened mortgage policy significantly and we are operating at heavily leveraged structural peaks in Canadian consumer spending and housing markets that are bound to slow as fatigue sets in." Still, debt continues to rise faster than incomes, despite the slight dip in the household debt to income ratio to 150.6 in the fourth quarter of 2011, from 151.9 in the third. Analysts, including Alexander, expect the ratio to keep climbing to 160 per cent, the level it hit before the U.S. housing implosion. Alexander points out there is no controversy among economists about the imbalance in the economy being caused by housing. All agree prices are too high, by anywhere from 10 per cent to 25 per cent, and debt is too high. The only disagreement is whether now is the time for Flaherty to act. Fortunately, the minister has time to wait and see, says CIBC economist Benjamin Tal, who has written extensively on housing and debt. Given the weakness of the economy, the Bank of Canada has little choice but to keep interest rates low. That gives Flaherty the flexibility to keep monitoring what happens on the debt front. "But if six months from now, you tell me house prices are up by another six, seven per cent and mortgage activity is back to seven, eight per cent, I would be more concerned," he said. Alexander would pull the trigger sooner. He says he believes the case for action is now but that would be "absolutely concrete" if this spring ushers in another strong real estate season.